Top choice for the younger Juniors... and for those Seniors not able to use size 00's in club play! 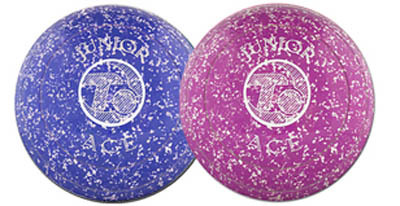 The Junior ACE has become the hottest bowl for Juniors! If you have a Junior Program or are thinking of starting a program that will include Juniors from ages 6 - 10 then you will want to get a set of the Junior ACE at your club. These bowls are based on the famous Taylor ACE bias giving your young bowlers a chance to learn the game with confidence right from the start. Some clubs even use Junior ACE with elder members who can no longer use a size 00, or 000, or even the 0000.